Sunrisers Hyderabad (SRH) is playing Mumbai Indians (MI) in the match no 19 of VIVO Indian Premier League (IPL), 2019. The action is taking place at Rajiv Gandhi International Cricket Stadium, Hyderabad. Mumbai Indians posted a total of 136/7 in 20 overs. This inning we witnessed the unusual run out of MI batsman Ishan Kishan, where SRH wicketkeeper Jonny Bairstow knocks the bail off before collecting the ball. Mumbai Indians vs Sunrisers Hyderabad Live Cricket Score 19th T20 Match. 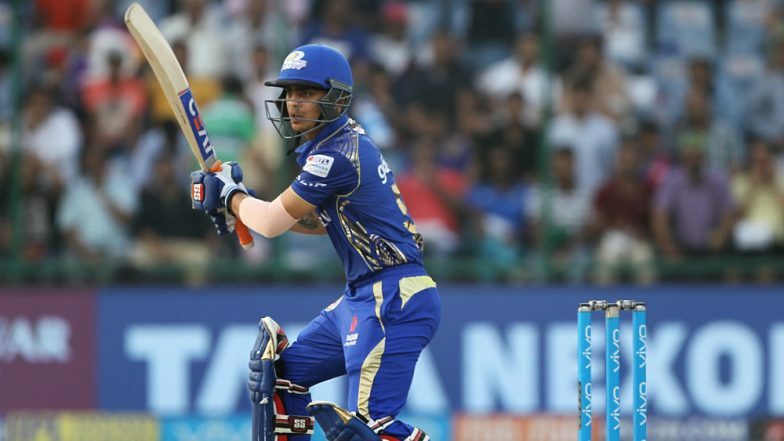 Ishan Kishan got dismissed in the 13th over bowled by SRH spinner Rashid Khan. Ishan made 17 from 21 deliveries. The left-handed Jharkhand batsmen punched the bowl towards the point fielder Vijay Shankar, he came out from the striker end and then decides to return back only to get himself run out. Watch Video of Ishan Kishan strange run-out, as Englishman Bairstow did smart work behind the stumps. Earlier on the inning Mumbai team had a bad start where their skipper was the first one to get dismissed by SRH all-rounder Mohammad Nabi. Nabi was well supported by his country mate Rashid Khan who also bowled economically well and took the crucial wicket of Hardik Pandya. Mumbai team middle order batsmen collapsed drastically as they had a tough time facing SRH bowlers. However, Mumbai Indians finished on a high note, as their batsman Kieron Pollard played an unbeaten knock of 46 from 26 balls. Pollard was dropped by Rashid Khan and Mohammad Nabi which enabled him to give Mumbai an outside chance of victory against SRH. Hyderabad will be disappointed with the sloppy work in the field, as they could have easily managed to keep Mumbai under a total of 120.